The Blockbuster Movie Is Now The Arcade Hit! 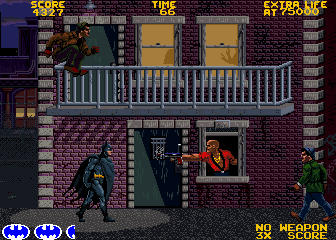 Packed with all the drama and action of the movie, the game even features digitized photos and actual music soundtrack. Take on The Joker and his Goons with Batrope, Batarangs and Gas Grenades. Kick and punch your way throughout Gotham City, even drive the Batmobile and fly the Batwing. In the end, share in Batman's triumphant victory over The Joker atop the Cathedral. Play out this classic confrontation of good versus evil at your Atari Games distributor today!